A North American company that specializes in the construction of shafts and tunnels for sanitary and storm sewers is in the process of completing a large-scale sewer that is nearly 10 feet in diameter and two miles long. The boring process required to create the sewer shaft is time consuming (the project is estimated to take two years to complete) and requires a variety of drilling equipment and machinery per the variances in the type of rock the tunnel passes through as well as other geologic factors. As is typical with any industry or company that utilizes heavy equipment and machinery, the mining company experienced equipment-related oil and fuel leaks upon starting the sewer construction process. To manage the leaks, the company used water to clear the oil and fuel from the tunnel, redirecting the oily wastewater into a 16 by 16 foot collection pit. The mining company prides itself on construction practices that minimize environmental hazards and needed to ensure they were properly managing the leaks in compliance with local and federal environmental regulations. As these regulations require contaminant-free wastewater, the mining company used a vacuum truck service to remove the oil from the wastewater in the collection pit. While vacuum truck services can adequately remove oil, they only offer periodic and scheduled removal. Additionally, depending on the size of the wastewater pit and the amount of oil, oil removal with a vacuum truck can take several hours or longer to complete, and the service is generally billed at an hourly rate. 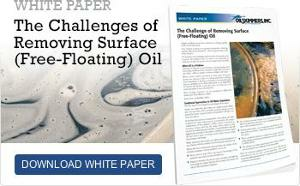 For facilities needing occasional oil removal, vacuum trucks are a viable option. However, for the mining company, oil was quickly and continuously building in the collection pit and the length of time between service visits became an issue, as did the frequency of visits required. In addition, vacuum trucks don’t necessarily collect oil alone. They tend to pick up a fair amount of water along with the oil so facilities that use vacuum truck services often pay not only to have oil removed, but also for the water that accompanies it. The mining company was soon incurring significant expenses to utilize vacuum trucks as a means for oil removal. After just a few times using the service, it decided to look for a more permanent oil-removal solution that wouldn’t incur an ongoing expense. While the company had previously heard of oil skimmers as a solution for removing oil from water, company representatives were initially skeptical about how well a skimmer would work for their specific application. Putting doubts aside, they decided to purchase an Oil Skimmers, Inc. Model 5H oil skimmer and, almost immediately, found the results they had been seeking. The Model 5H waste oil recovery system from Oil Skimmers, Inc. runs continuously, 24/7, with little to no maintenance needed. It is fully automatic and features a smaller footprint so it can be positioned in very close proximity to the wastewater tank, and can be installed on open or closed tanks. Using a specially formulated, proprietary oil collector tube, the Model 5H efficiently and effectively removes oil from wastewater. As the floating, closed-loop tube is drawn across the surface of the water, oil adheres to the outside of the tube. The collector tube moves easily around any debris floating in the water, doesn’t clog, and continuously skims waste oil. The tube is drawn up into the skimmer and through ceramic scrapers that remove the oil. The tube returns to the water surface to collect more oil, while the recovered oil flows to a collection container. Oil Skimmers, Inc. customized the Model 5H specifically to meet the mining company’s application need, allowing for an easy, seamless installation of the new skimmer. Within five hours of installing the skimmer, all of the oil/hydraulic fluid had been completely removed from the collection pit and was ready to be recycled. After seeing the immediate results, the mining company also chose to install a heating unit for the skimmer as an added weatherization measure for colder months. For nearly 50 years, Oil Skimmers, Inc., has provided oil removal solutions for all industries and applications around the world. This breadth of experience has made us the leader in designing and delivering oil removal solutions for even the most diverse and demanding applications. And, our oil skimming solutions are custom engineered to meet your facility’s needs. From the basic to the complex, we have developed complete waste oil recovery solutions for facilities both large and small that are efficient, maintenance-free and effective. With Oil Skimmers, Inc., you are not only guaranteed the very best in oil skimming technology, you are also provided superior customer service. We meet with our customers, visit their facilities, and we make it our mission to help solve their issues, address their challenges and devise solutions that will meet their individual needs. With numerous mounting systems available to ensure easy installation and peak performance, we can specify and install an oil skimmer that is customized specifically to your application needs. Call our representatives today to determine the oil skimming solution that will work best for you. To see the Model 5H in action, watch our video.